Interbus is a private bus company serving several different routes daily throughout the country. The vehicles are modern Mercedes minivans with a capacity for up to 15 people. Guests will be picked up directly at the hotel and taken to their destination hotel. This is the ideal opportunity for independent travellers, who wish to explore Costa Rica in a comfortable and economical way, but would like to enjoy the safety and comfort of pre-arranged hotels and reliable transfers. 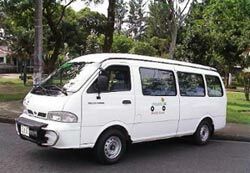 Following the Interbus schedule, we will be pleased to prepare personal, customized tours throughout Costa Rica for you! 1 Arenal Route: from San Jose (8:00 a.m.) to La Fortuna, Arenal Volcano; returning 1:30 p.m.
2 Pacific Route: from San Jose (8:00 a.m.) to Manuel Antonio; returning 1:30 p.m.
3 Caribbean Route: from San Jose (8:00 a.m.) to Cahuita, Puerto Viejo; returning 1:30 p.m.
5 Papagayo Route: from San Jose (8:00 a.m.) to Golfo Papagayo; returning 1:30 p.m.
6 Monteverde Route: from San Jose (8:00 a.m.) to Monteverde; returning 1:30 p.m.
7 Lake Route: from La Fortuna (8:00 a.m.) to Cañas (connection Route 4 and 5); returning 1:30 p.m.
8 Monte-Guanacaste Route: from Monteverde (8:00 a.m.) to Tamarindo, G. Papagayo; returning 1:30 p.m.
9 Monte-Lake: from Monteverde (8:00 a.m.) to La Fortuna; returning 1:30 p.m. Please contact us for exact schedules and rates.